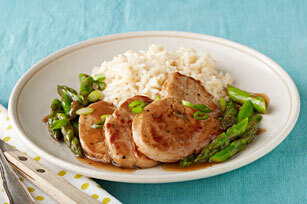 Enjoy this smart supper recipe, made with pork tenderloin and fresh asparagus, with a side of hot cooked brown rice. Pour 3 Tbsp. dressing over meat in shallow dish; turn to evenly coat meat. Refrigerate 15 min. Heat oil in large skillet on medium-high heat. Add half the meat; cook 2 min. on each side or until evenly browned on both sides. Transfer to plate. Repeat with remaining meat. Carefully wipe skillet clean with paper towels. Mix corn starch and 1/4 cup broth until blended; set aside. Add remaining broth, dressing and asparagus to skillet; cook and stir on high heat 2 to 4 min. or until asparagus is crisp-tender. Stir in corn starch mixture; cook 2 min. or until sauce is clear and thickened, stirring constantly. Return meat to skillet; sprinkle with pepper. Cook 2 min. or until heated through; top with onions. Serve with rice. To trim off the woody ends of asparagus stalks, grab each stalk and apply pressure at the bottom. The asparagus will naturally snap where the woody part ends. Or, line up asparagus spears on cutting board, then trim all to be the same length. Help your friends and family eat right with this tasty skillet meal that provides a good source of iron, per serving.